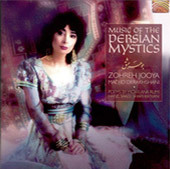 Zohreh Jooya’s music builds bridges between the cultures of Iran, Afghanistan and the Western world. Music of the Persian Mystics is a collection of songs from the Sufist traditions adapted for instrumentation by Madjid Derakhshani, a masterful Iranian string player as well as the founder of an Iranian music school in Germany. Zohreh Jooya, the Iranian-born Western opera singer, provides the majority of the vocals (along with Derakhshani himself). The concept behind the album is to fuse, to some degree, the musics of Persia with those of the Occident. The songs themselves are from the poetic repertoire of the greats of Sufist thought: Rumi, Saadi, and Hafiz, among others. The instrumentation, though, will make the listener take note of the inclusion of a saxophone and cellos at the least, and a stray tabla wandering in from the east. The vocal delivery by Jooya is the other aspect one might note as distinctly Westernized. The lyrics are in Persian, but the delivery is clear and powerful in the form of the Western opera, with the distinctive throatiness of Middle Eastern vocals missing almost entirely. The coalition between styles of music doesn't really do the poetry justice, as some of the emotion is seemingly stripped from it by the more austere vocal style. The instrumentation coalition does provide an interesting starting point toward a more thorough fusion of styles, but it's rather shaky. All of the performers play their parts excellently, but it's the use of them together that may make the listener wonder. Pick it up for a look at one idea of the fusion between the Occident and Orient, but pick up others first, perhaps artists under Peter Gabriel's projects, or one of Hossam Ramzy's various forays. 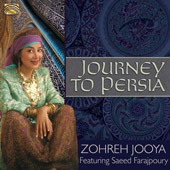 A trio of stringed musicians on Iranian lutes and fiddle (tars & kamancheh), percussionists, and oud and ney (flute) players combine with singer Zohreh Jooya to weave a rich tapestry in Journey To Persia. Protracted intros and breaks allow the virtuosic accompanists ample scope for expression, culminating in an outstanding instrumental piece, ‘Yortime’, to close the program. Jooya opens with an animated work from her native north-eastern Iran, but her delicate, opera-honed vocals are equally compelling and poignant delivering love songs in Azeri from the Iranian part of Azerbaijan and in Kurdish from western Iran, in standard and falsetto mode.